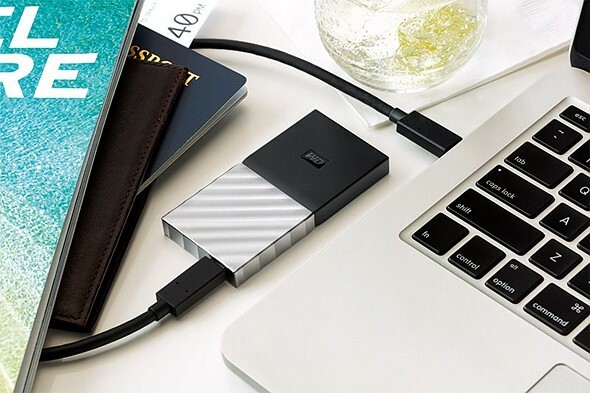 Western Digital today announced its first portable SSD, adding solid state storage technology to its My Passport line of portable storage devices. The new My Passport SSD comes with a USB Type-C port and with transfer speeds of up to 515 MB/s is WD’s fastest current My Passport model. The My Passport SSD is available with capacities ranging from 256GB to 1TB and its small dimensions make it very portable. It has also been drop tested from a height of 2m / 6.5ft and Western Digital claims it can withstand 1500G of force. The Western Digital My Passport SSD comes with a USB-C to USB-C cable and a USB-A adapter in the box. It is available now from Best Buy and from other select retailers starting this quarter. The 256GB model will set you back $99.99, the 512GB version is $199.99, and for the 1TB variant $399.99 have to be invested. More information is available on the Western Digital website.